Point Pleasant sophomore Olivia Dotson (10) leaps for a spike attempt during Game 1 of Monday night’s volleyball match against Teays Valley Christian in Point Pleasant, W.Va.
POINT PLEASANT, W.Va. — A little easier the second time around. 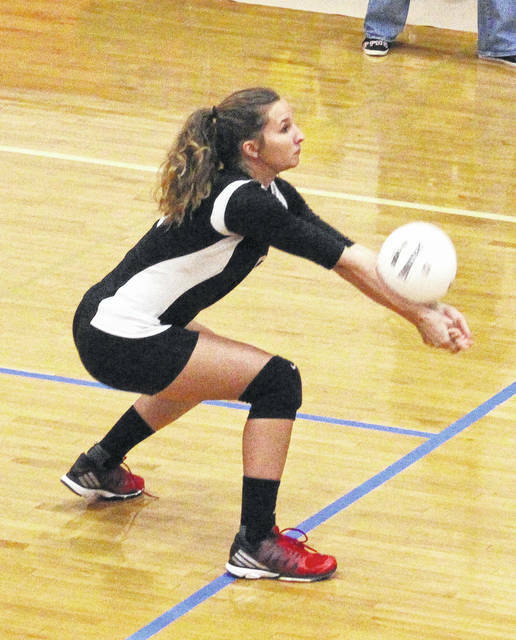 After needing five sets to win the first matchup against Teays Valley Christian, the Point Pleasant volleyball team had little trouble with the rematch Monday night during a 25-11, 25-10, 25-18 non-conference victory in Mason County. 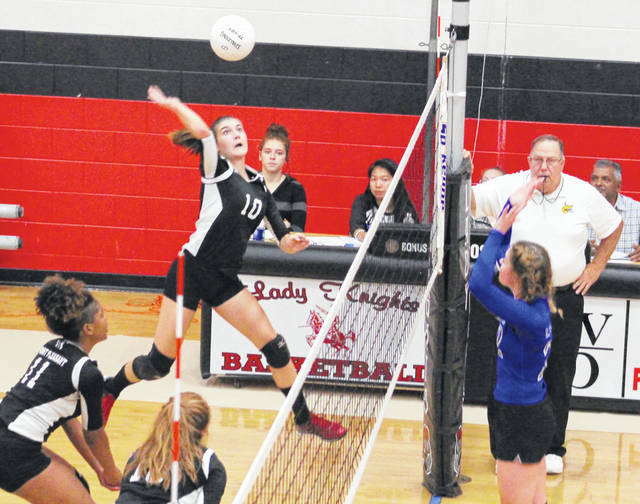 The Lady Knights (16-3) — who claimed a 3-2 win at TVCS back on Sept. 26 — left little doubt in the second meeting as the hosts recorded 31 kills as a team and trailed only during the final game. In fact, Point’s largest deficit of the night was two points on a pair of different occasions in Game 3 — but the Red and Black rallied back from a 17-15 hole by scoring 10 of the final 11 points to complete the straight-game triumph. PPHS led wire-to-wire in Game 1 as the hosts jumped out to early leads of 5-0, 6-3 and 11-4. The Lady Knights had 13 kills in the opener and scored the final three points en route to a 14-point win and a 1-0 match advantage. Point Pleasant again led wire-to-wire in Game 2 after establishing early leads of 4-0, 6-1 and 12-3. The Red and Black had nine kills in the middle set and scored the final three points while taking a 2-0 match edge with the 15-point victory — the hosts’s largest lead of the night. There were nine ties and 10 lead changes in the finale, the Lady Lions (12-9) claiming their first lead of the match at 5-4. 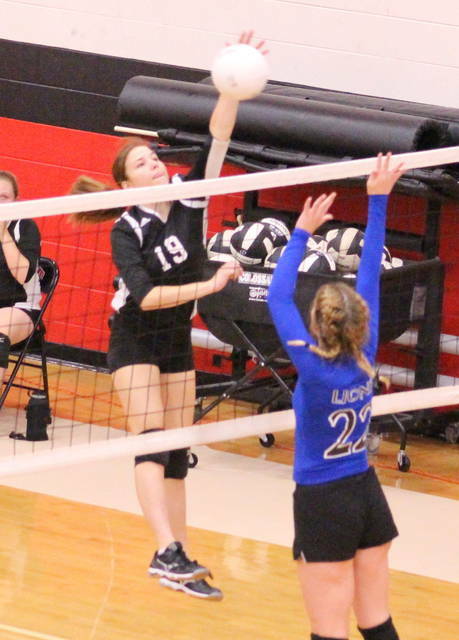 TVCS held on for leads of 14-12 and 17-15, but the hosts rallied for a 21-18 edge before scoring the final four points en route to the 3-0 match victory. Gracie Cottrill and Peyton Jordan led the PPHS service attack with 16 points apiece, followed by Olivia Dotson with eight points and Brenna Dotson with five points. Mackenzie Freeman and Madison Hatfield also contributed four points and two points, respectively. Cottrill, Freeman and Jordan each recorded two aces, while Hatfield and Olivia Dotson added a service ace apiece. Brenna Dotson posted team-bests of 10 kills and a block for the Lady Knights, followed by Lanea Cochran with nine kills. Hatfield and Olivia Dotson were next with four kills apiece, with Cottrill also adding two kills. Tristan Wilson and Haley Milhoan also had a kill each for the victors. Holli Bragg led TVCS with five service points, followed by Meredith Northup and Adora Campbell with three points each. Caroline Moses and Holly Edwards were next with two points apiece, while Makana Landers and Chloe DeMuth each had one point in the setback. Point Pleasant hosts Hannan on Tuesday night in a battle of Mason County programs at 6 p.m.